Columbia Md Hair Salon / Vivid Salon Columbia Md – Tells About 5 Secret Benefits Of Hair Extensions | Best Salon and Spa in Columbia MD! Improves your hair texture. We use human hair extensions, which blend with your natural hair. This makes the overall texture of your hair smoother and softer. Adds volume. This is huge for women with fine, thin, limp hair. They can’t believe the difference. It’s dramatic and they’re ecstatic. 3. Adds length. Women with slow growing hair despair of ever having longer locks. 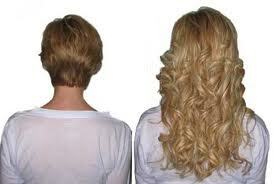 With hair extensions, you can lengthen hair in a matter of a few hours! 4. Adds fullness. Get more body and bounce instantly with extensions. 5. Adds new life to dull, damaged hair. Grow out damaged hair and camouflage it with extensions. Enjoy more body and bounce, too! And don’t think you have to add a whole head full of extensions, either. It can be as simple as adding a few fun colors to your hair. if you want your hair to have the Hair Extensions benefits, it’s what we do best at Vivid Salon located in Columbia Md.! ← Hair Salons in Columbia Md / Vivid Salon Columbia Md – Is “Lather,Rinse,Repeat” Enough?